August 14, 2018 (New York) – Pandora is the most popular music streaming service in the US. But that will change in the coming years, according to eMarketer’s latest forecast on digital audio listeners. This year, Pandora will have 75.9 million users in the US,* compared with 58.4 million for Spotify. 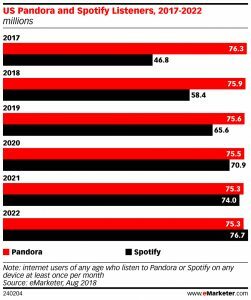 However, eMarketer expects Pandora’s user base in the US to continue to decline slightly throughout the forecast period, while Spotify will see double-digit growth this year and next. By 2022, the market share will have shifted, with Pandora’s user base dipping to 75.3 million users, while Spotify’s will swell to 76.7 million. *Internet users of any age who listen to Pandora or Spotify on any device at least once per month.